ACAPULCO, Mexico (Reuters) - Mexico's central bank is working to include ride-hailing firm Uber Technologies Inc in a new mobile payments system at the heart of its financial inclusion strategy, the bank's chief said on Friday, building on overtures to Amazon.com Inc . 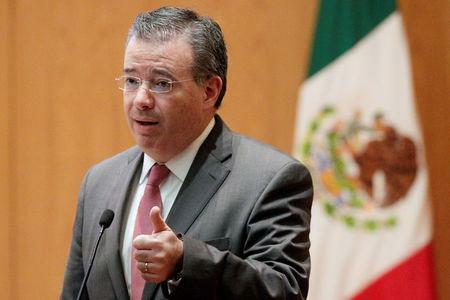 In an interview, Banco de Mexico Governor Alejandro Diaz de Leon said the bank was seeking to get more companies on board, including San Francisco-based Uber. The central bank has already been in touch with Amazon and its Argentine rival, MercadoLibre, about adopting the system, the bank's head of payments told Reuters. Uber in Mexico did not immediately respond to a request for comment. The payment system, known as CoDi, will allow customers to make payments through smartphones free of charge using QR codes. While the bank is still figuring out how to include companies, the program will be defined as broadly as possible, Diaz de Leon said. "For us it is very important in this phase of pilot tests to give more information about what is CoDi and how it works, and try to identify all the possible uses ... that it can have for different companies and different users," said Diaz de Leon. Mexico's new leftist government under President Andres Manuel Lopez Obrador is betting on financial technology to help lift people out of poverty in a country where an estimated 42 million people lack bank accounts. Broad acceptance of CoDi would mark an important step in its financial inclusion strategy. Phone-based banking is popular in other emerging markets such as China, India and Kenya, and has been driven by user-friendly, affordable apps from private companies.